Dry to moist. Uplands. Full sun. This deciduous hardwood tree may be the most widely distributed tree in North America. It is the most abundant tree in Minnesota. It is a successional species that pioneers disturbed sites and is gradually replaced by slower-growing species. It is fast growing and short lived, commonly lasting only 80 to 100 years. Older individuals can survive up to 200 years. It reproduces rapidly by root suckers often forming large clonal colonies. Mature trees in the state are usually 40′ to 60′ tall and 7″ to 12″ in diameter at breast height. Large individuals can reach over 90′ in height. Some of the tallest quaking aspens in North America are in north-central Minnesota. It rises on a single stem from a shallow, wide-spreading root system. On well-drained soils it develops a many large and small, branched roots extending horizontally, diagonally, and vertically from the trunk in all directions (heart root system). The trunk is slender and free of branches on the lower part. The branches are short and stout. The crown is narrow, open, and rounded. 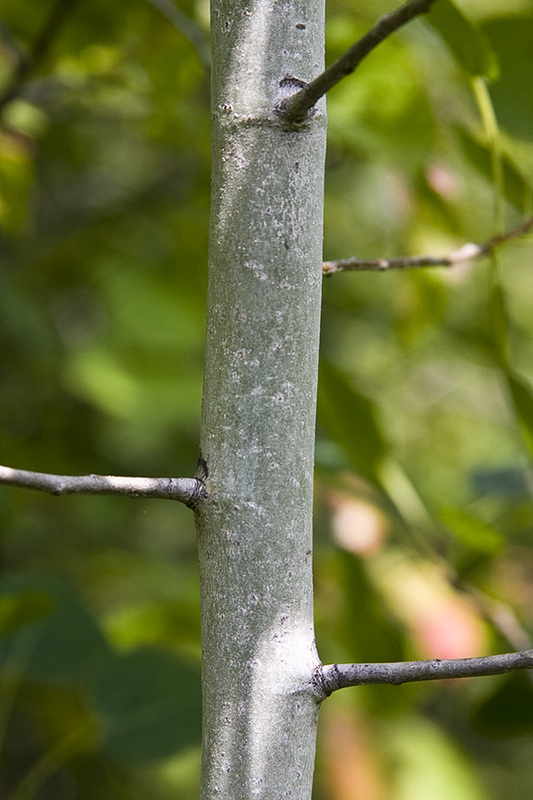 The bark on young trees is smooth with a waxy appearance, and pale grayish-green to whitish-green or almost white. It does not peel like paper birch. As it ages it becomes thick and gray or brown, with broad, flat ridges and shallow furrows, at least near the base of the tree. The current-season twigs are slender, shiny, hairless, and dark green or reddish-brown with oval, orange dots (lenticels). They are round in cross section and have star-shaped pith. They turn gray and rough in the second year. 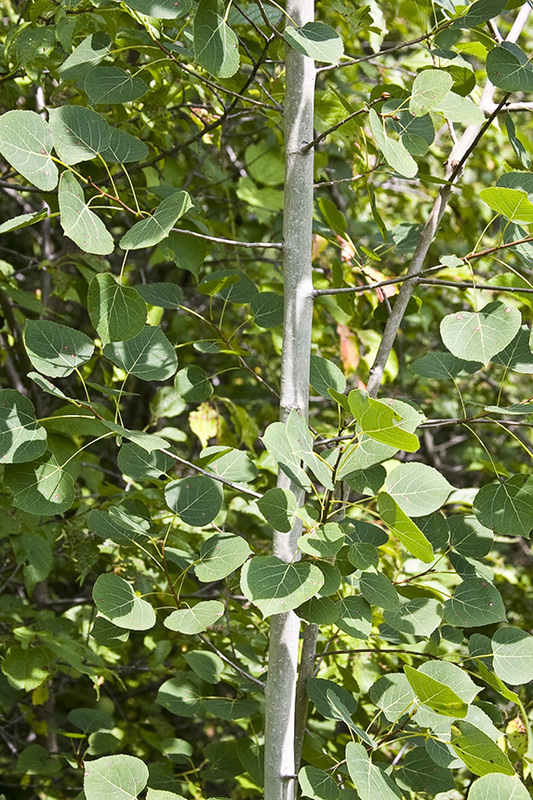 Quaking aspen is self-pruning, dropping numerous twigs with the leaves in autumn. Terminal buds are brown, hairless, slightly resinous, and have a shiny or varnished appearance. They are not aromatic. They are about ¼″ long, slender, cone-shaped, and pointed. They are covered with 6 or 7 bud scales. Lateral buds are similar but smaller. They are appressed against the twig with the tip pointing inwards. 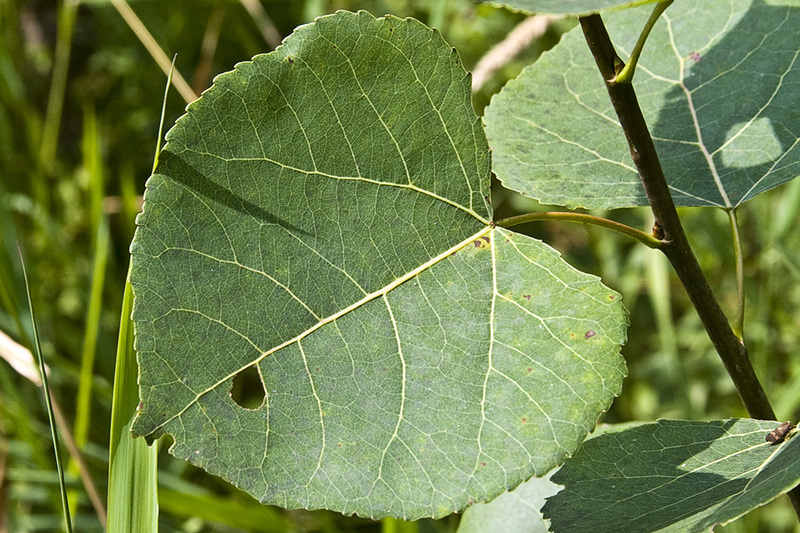 The leaf scars are small and triangular with 3 bundle scars. The leaves are deciduous, alternate, thin, firm, and not lobed or divided (simple). They hang downward on hairless, 1⅛″ to 2¾″ long leaf stalks. The leaf stalks are flattened perpendicular to the plane of the leaf blade, at least near the blade attachment. It is often longer than the leaf blade. The flattened leaf stalk causes the leaf to tremble, or quake, in the wind, giving the tree its common name. The leaf blades are broadly egg-shaped to almost round, 1⅜″ to 3″ long, and 1¼″ to 3″ wide. They are 0.9 to 1.2 times as long as wide. They taper abruptly at the tip to a short point with concave sides along the tip. They are broadly rounded or almost straight across at the base. The upper surface is dark green or bluish green, shiny or waxy, and hairless. The lower surface is similar but paler green. The margins are finely toothed with 20 to 50 irregular, shallow, blunt teeth per side. The teeth do not have embedded glands. There are no visible warty glands where the leaf blade attaches to the stalk. In autumn the leaves turn bright yellow. Male and female flowers are borne on separate plants. They appear before the leaves in early April to early mid-May. Both male and female flowers are borne in crowded, pendulous, stalkless catkins on 2nd year branchlets. Male catkins are 1⅛″ to 3⅛″ long, female catkins are 1⅛″ to 2⅜″ long. 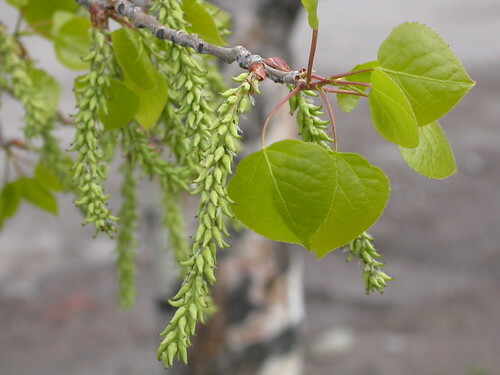 Female catkins elongate when fruiting, becoming 1½″ to 6″ long. The fruit is an egg-shaped, ⅛″ to ¼″ long, 2-valved capsule. Each capsule contains numerous seeds. The seeds are released early mid-May to early June. They have cottony hairs attached and are dispersed by wind. Balsam poplar (Populus balsamifera) bark on young trees is greenish-brown. The leaf stalks are rounded, not flattened. The leaf blades much longer, 3″ to 6″ long, 1.3 to 2.3 times as long as wide. The underside of the leaf usually has blotchy, copper-colored stains. Each tooth on the leaf margin has a small, embedded gland. 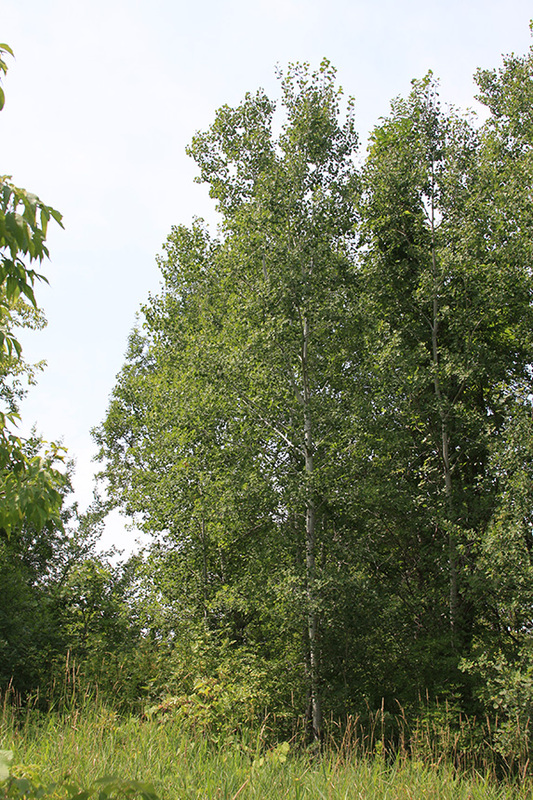 The champion quaking aspen in Minnesota is on private property in or near Emily, in Crow Wing County. In 1999 it was measured at 96′ tall and 123″ in circumference (39¼″ in diameter). A group of genetically identical individual plants derived from a single parent plant by means of vegetative reproduction. A root system in which many large and small, branched roots extend horizontally, diagonally, and vertically from the trunk in all directions. A leaf that is not divided into leaflets, though it may be deeply lobed or cleft. Native tree to 45 m tall, with generally smooth white bark from the base (furrowed with age), orbicular leaf blades born from laterally flattened petioles, throughout the western half of Montana along streams, in wetlands, and on slopes north-facing and similarly protected slopes. Cool Things in Nature!!! Ecosode: Quaking Aspen! Hello and welcome to Cool Things in Nature! In today's ecosode, Coolia teaches us about the Quaking Aspen tree! It is possibly the largest organism on Earth! Watch and learn! Primary succession after a fire: the hummingbirds are loving those new flowers (Penstomen barbatus); they feed on those. 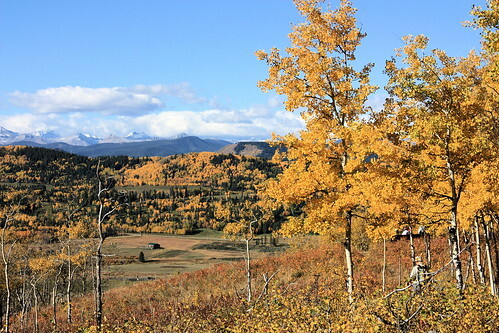 Aspens are highly competitive after forest fires; they typically sprout when the soil temperature increases after a fire.